How many of you have piles of paper cluttering up your living spaces that just keep piling up? You need something you simply can’t find, and don’t have time in the moment, so more gets piled onto to that mixed up ever-growing pile of paper. Maybe life has been so busy that you have multiple piles of paper in different locations. When you have time, make yourself a cup of tea and let’s get moving! We want to help you de-clutter with a few easy guidelines. If you need to do this in a few sessions, do that. Don’t put pressure on yourself to finish everything at once. It’s about taking one step at a time in the right direction and creating an easy flow of new organized habits. First, move all your piles of paper to one area with a bit of space so you can easily organize them. To start, make two piles, one for shred/garbage and the other for papers you want to keep; for the papers you want to keep, make a folder for paid bills adding to it immediately after you pay your bills. You should also keep a folder for receipts, as this will help you when you want to make a return on an item. How many times have you wanted to make a return spending precious time tracking down that receipt, and still at times been unable to find it? Create another folder for warranties and manuals. This folder will hold everything inclusively from fridge warranties to electronic manuals. Then make 12 other folders labeled for each month of the year. Begin to organize your papers by month. The idea is to manage the flow of paper as it comes into your space. In the beginning of each month, you can look into the current month’s folder for papers that require your immediate attention for that month. Once attended to, these papers are either shredded or reallocated into your paid bills folder. Make sure to keep all in-coming paper in one place, preferably in a container of some kind, keeping your space contained, tidy and uncluttered. Make this the paper place! It will prevent wasting time locating a specific letter or paper when you desperately need it. It sounds simple and it really is, once put into practice. Again do not get overwhelmed. Implement this practice in a few sessions if necessary, and remember, when a new paper comes in, put it in your paper place or immediately into your newly created folders. You’ll be so relieved and happy you simplified your life. Cheers to an uncluttered stress-free environment! Paper towels were invented by the Scott Paper Company in 1907. Initially, they were designed to be used as toilet paper, and not to be used for daily household use. Paper towels only came to be widely used as a cleaning tool in 1931. Because paper towels have proven to be extremely convenient and effective, they are now used for basically everything from the kitchen, to the bathroom, to household windows and much more. Paper towels work to soak up large amounts of water because they are loosely woven together, allowing the water to travel between them. Manufacturers have introduced circles or shapes to maximize the effective absorption of liquids. So what’s the issue you may ask? What do we need to know? While paper towels may be highly convenient we should stop and ask ourselves, what happens to the waste and how is the manufacturing of this product affecting our environment? We were unable to find a Canadian source showing usage but we are able to show that in the US alone, 13 billion pounds (6,500,000 TONS) of paper towels are used each year. To manufacture one ton of paper towels requires the harvesting of 17 trees and the pollution of 20,000 gallons of water. This means that 110,500,000 trees are cut down each year and over 130 billion gallons of water are contaminated to satisfy the US demands for paper towel use alone. We are not abdicating the use of paper towels nor are we suggesting that we will never use them. However, becoming conscious of the wide-spread effects of our consumerism on our global environment provides food for thought and grounds for future conscious decision choices. 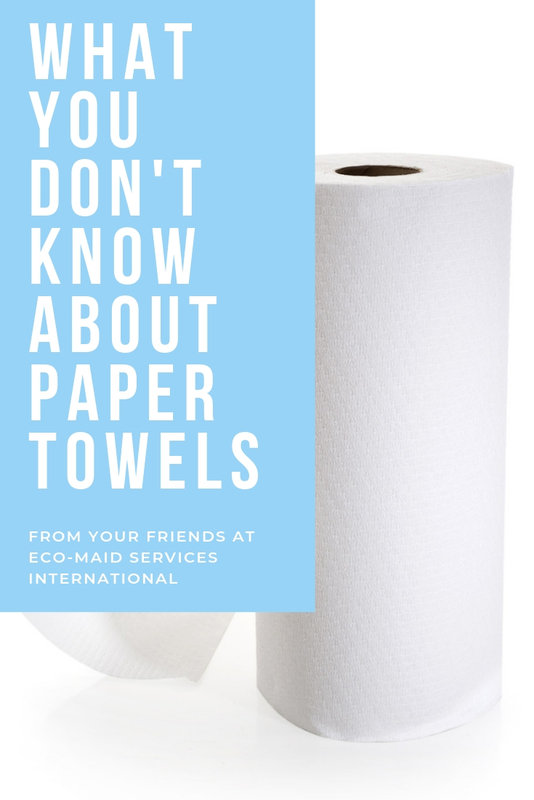 We could make a cumulative difference if we simply cut down on using paper towels, helping to sustain our environment and saving money in the process. Let’s try to use cloths (microfiber cloths are especially effective and of course reusable) or wet sponges as a replacement. Every little thing we do counts in creating a more sustainable and healthier environment where everyone stands to prosper. A clean and organized room can feel incredibly satisfying. According to Psychology Today, decluttering can function as a kind of therapy to support mental health. Here’s how to declutter each room in your house in an eco-friendly way. Maximizing the lifespan of your appliances can be a useful way to help control emissions. This can be done by cleaning them regularly, avoiding overuse, and repairing them instead of replacing them. If you’re in the market to replace, however, some household appliances like refrigerators are being engineered to reduce greenhouse gas contributions. You can also recycle your kitchen appliances by contacting your local waste center. Some offer curbside pickups, while others will pay you to drop off your appliances. Some appliance companies also offer recycling programs. Many toxins in your cleaners can harm the water and air. Making your own environmentally friendly cleaning products isn’t all that difficult. Vinegar is a great basic ingredient for all-purpose cleaning, as is baking soda. Borax powder can be used, as well. If you need to clean glass, use vinegar, water, and rubbing alcohol to get rid of streaks and spots. Vinegar and baking soda also work powerfully against grease and grime. If you combine the proper amount of vinegar and baking soda together, they can form a paste. Apply it to the shower floor, tub, or sink, and let it sit. After an hour, scrub it down and rinse. You can do the same for the toilet by first pouring in vinegar and then baking soda or Borax. Let it sit for at least 20 minutes, scrub with a toilet brush, and then flush. It’s common to have multiple backups of a particular toiletry item or to hold onto something “just in case.” While it’s fine to have a backup item, you shouldn’t have too many. Don’t hold onto things you don’t use; give them away instead, or just chuck them. Each year, millions of mattresses are thrown out. Thankfully, many mattress recycling resources can recycle your mattress in an ecologically conscious way. At least 20 states have mattress recycling facilities. Search online to see if there’s one nearby. You can also choose to donate your mattress to a Goodwill or a thrift store, or recycle it yourself. You (or someone more experienced) can disassemble your mattress and reuse, donate, or even sell the materials. These include the stuffing, fabric, and coils. The apparel industry has a huge environmental impact. Separate your clothes into “yes” or “no” piles. After you’ve decided on what to get rid of, you can donate or sell your clothes. To make your beloved ones last longer, patch them up or get them tailored. Vacuuming isn’t just reserved for the living room, but it can be a high-traffic area. After you’ve cleaned out your house, keep it that way. One option is to buy a cordless vacuum that is easy to store and use. It will also help you with spot vacuuming when you have a small mess to clean up. Plus, it won’t take as long. If you have too many documents and photos cluttering up your house, scan and upload them to an online server. Cloud storage is extremely secure and offers the benefit of sharing photos or mementos with other people instantly. There are some books you might have read once but will never read again. There are lots of organizations where you can donate your books so that you can help other people enjoy them. Recycling and reusing are great ways to minimize your carbon footprint. You can get rid of things that don’t suit you anymore while still helping the environment. It takes a little creativity and a lot of effort, but you can help the world be a greener place.